Everyone loves a good sequel, and as I am not currently starring in an extreme kung fu, fast cars, sweaty muscles, calmly walking away from an explosion- movie, I think this calls for (drum roll please) a food sequel! Shocking, I know. Almost action movie shocking… almost. There are 5 sandwiches recipes, all right here. One for every day of the work week, although I am a big fan of sandwiches for dinner too. Many of these can be prepared in advance, so check the notes for tips. Now let’s get sandwiching! (Said in an awesome action movie kind of way). What the smoky tastes of a BBQ in a hot sandwich? Toss this sandwich together in no time for the perfect hearty meal. Heat the olive oil in a pan over medium-high heat. When hot add in the onions and garlic and sauté for about 5 minutes until the onions turn translucent and begin to brown. Add the black beans, BBQ sauce, and salt and pepper. Heat through. 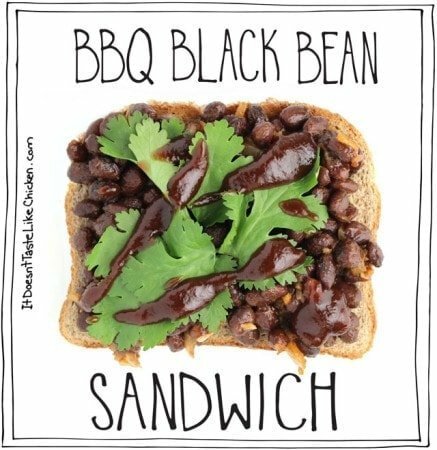 Pile the beans on bread, toast, or a tortilla, garnish with cilantro, then drizzle a little extra BBQ sauce on top. BBQ Black beans can be prepared ahead of time. If brining to work, I like to bring them in a separate container, so I can heat them up before piling them on the bread, If that seems too fussy, this sandwich is still great cold too! The cilantro hummus is fresh, herby and a little tart, which compliments perfectly with the sweetness of the red pepper. You can also just skip the sandwich all together (although that wouldn’t make a very good sandwich recipe), and dip veggies right into this hummus. Add the chickpeas, cilantro, tahini, water, lime juice, salt and pepper to a food processor. Blend until smooth, stopping to scrape down the sides as needed. 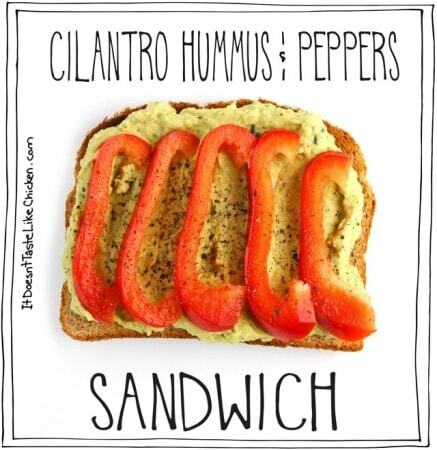 Spread a thick layer of the cilantro hummus on bread, toast, or tortilla and then layer with the sweet red pepper. The cilantro hummus can be prepared in advance and stored in an air tight container in the fridge. 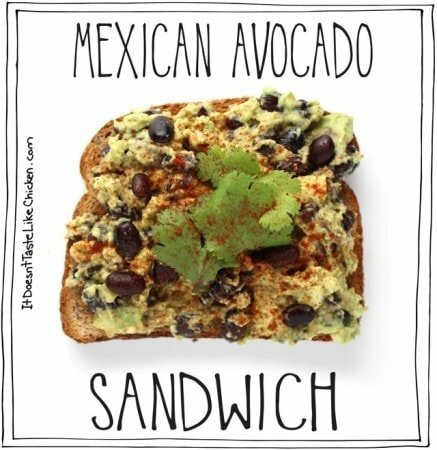 Avocado toast just got a face lift with black bean, lime juice, and smoked paprika for a fun Mexican-inspired twist! Scoop out the flesh of the avocado and put in a medium bowl. Add the lime juice, salt, and pepper. Lightly mash with a fork. Stir in the black beans. Spread a thick layer of the avocado mixture onto bread, toast, or a tortilla. Top with cilantro and a sprinkle of smoked paprika. Top with cilantro and a sprinkle of smoked paprika. This one is best prepared the same day you plan to eat the sandwich. Avocado may brown if stored for too long. If you are looking for an upgrade to a classes PB & J, this is it! The sticky peanut butter is cut by the fresh pear, topped with a little added flair of coconut flakes. Yum! 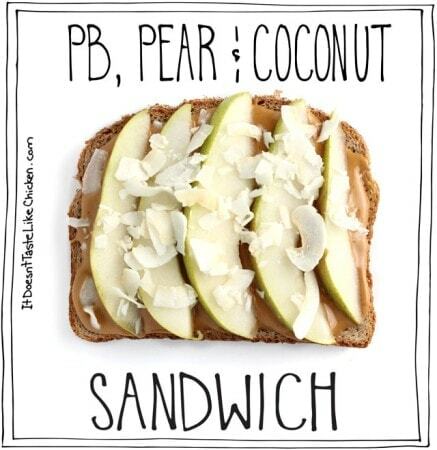 Spread the peanut butter on the toast, top with pear slices and then sprinkle with coconut flakes. Marinating then sautéing the portobellos locks in the flavours. Add a drizzle of hoisin sauce on top and your mouth will do a little thank you dance. Mix together the rice vinegar, oil, soy sauce, agave, and garlic in a medium bowl. Add the portobello and toss to coat. Let the mushrooms marinate for 10 - 20 minutes, turning every now and then. Heat a skillet over medium heat, add the mushrooms and the remaining marinade. Sauté for about 5 minutes, then flip the slices and sauté another 5 minutes so that both sides are caramelized and the mushrooms are tender. Layer the sandwich with spinach and red onion, then top with the portobello slices. Drizzle with hoisin sauce. Best served hot. I have gone vegetarian and I’m on my 4th week of it. Not really that difficult, however, I feel strongly about taking it a step further and going vegan. The thing I’m having a problem with is……Vegan Vegetarians do not eat eggs, correct? So is there such a thing as vegan bread? Most breads contain eggs and sometimes milk. Tortillas don’t contain eggs or milk, but contain lard which has animal fat in it. I would love to make these sandwiches, but I’m curious about the bread and tortilla and what vegan options I have for bread. I didn’t have smoked paprika so I substituted it with about 1/4 teaspoon of cumin. Great combination. I’ll be trying the other sandwich recipes as soon as I get the chance. Great website! Love your Blog, I’m gonna try the sandwiches first , and them other recipes. My son André is the one who show me how to eat health food. P.S. I f one day You come to Brasil, be very welcome!! Still loving you and your great recipes. Thanks so much for sharing. May God continue to bless you and yours, my dear. What a great post. Thanks so much for sharing! 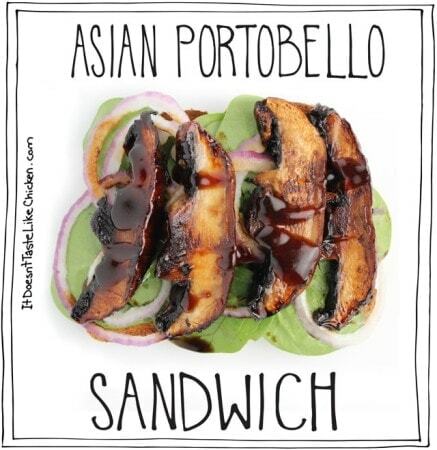 Portobello sammies are one of my faves! I always add red onions & spinach, but haven’t tried marinating the mushrooms. I just coat the whole cap in oil & sprinkle on salt & pepper, then roast in the oven, or on the grill during summer BBQs. I’m definitely going to try marinating & pan frying them now! Thanks! Oh, you have to try marinating them! It just takes it up a notch. So delicious. I hope you enjoy them benilana! Hmmmm I’m all over that BBQ black bean one! Never thought of putting beans in a sandwich, although I put them in wraps all the time! Yum, love these ideas! Yes, the are the best! They instantly make a hearty sandwich, and can be mashed or left whole. I always have several cans on hand, so it’s great for those go to kinda meals. Enjoy Nicole! Always LOVE a good sandwich. Liking the looks of that BBQ bean – Summer-like! But I think I would be fired if I wore a bathing suit at work – oh, wait, I work with hubby – he may just give me a raise! Ha ha.